“Yes I think we deserved a point. If you look at the first half we got into good areas and we looked a threat and a force. “We need to get more shots of and we need to test their keeper a bit more but the pleasing thing for me is that we got into those areas and caused them problems. “What about Paul McElroy’s goal? “I thought he did very well and he played up-front on his own at various times. “He gets hold of the ball very well and he deserved his goal. “It was on his weaker foot and I am just glad Andrew Mitchell didn’t score because that would have been the first thing you would have asked me. “But Andrew has gone and we have to move on and thankfully McElroy has started to fill his boots..
“He has exceptional well for us and he has done really well in our last two games. 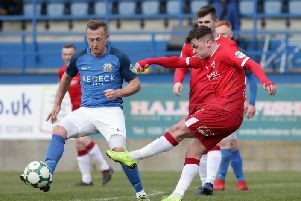 “We have gone away to Crusaders and Glenavon against good centre-halves and good defenders and he has won headers, he has held the ball up and he has chased lost causes.